Big Data Application in Power Systems brings together experts from academia, industry and regulatory agencies who share their understanding and discuss the big data analytics applications for power systems diagnostics, operation and control. Recent developments in monitoring systems and sensor networks dramatically increase the variety, volume and velocity of measurement data in electricity transmission and distribution level. The book focuses on rapidly modernizing monitoring systems, measurement data availability, big data handling and machine learning approaches to process high dimensional, heterogeneous and spatiotemporal data. 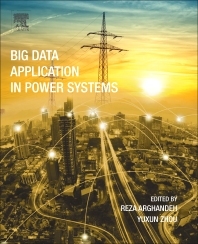 The book chapters discuss challenges, opportunities, success stories and pathways for utilizing big data value in smart grids. Contributed to the Elsevier publication “Renewable Energy Integration: Practical Management of Variability, Uncertainty and Flexibility” and has published more than 20 journal papers related to smart grid technologies, monitoring systems, data analysis for control, and diagnostic application in power systems. Distributed Control, Data Analysis, Modeling & Simulation Tools for Power System/Power Electronics Diagnostics and Operation applications including but not limited to: Distributed Energy Resources Integration; Buildings, Mircogrids and Distribution Management Systems (BMS-DMS); Grid Automation; Adaptive Demand Response; Electric Grid Observability; Distribution Network Model Validation; Smart Grid Cyber-Physical Resilience; and Internet of Power Electronic Inverters. Yuxun Zhou is currently a Ph.D candidate at Department of EECS, UC Berkeley. Prior to that, he obtained the Diplome d’Ingenieur in Applied Mathematics from Ecole Centrale Paris, and a B.S. degree from Xi’an Jiaotong University. Yuxun has published more than 20 refereed articles, and has received several student awards. His research interest is on machine learning and control methods for modern sensor rich, ubiquitously connected energy systems, including smart buildings, power distribution networks, power systems with renewable integration, etc. Among others, he has designed novel algorithms for non-convex machine learning problems, and has constructed a series of event detection methods for complex systems with resource and information constraints.